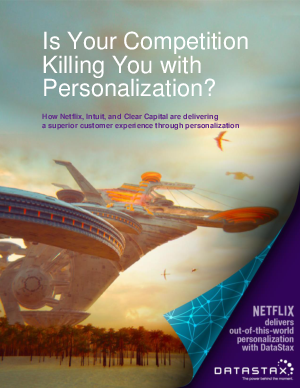 > DataStax > Is Your Competition Killing You with Personalization? Banks are at an inflection point. According to a recent research by Viacom, 1 in every 3 U.S. consumers are open to switching banks in the next 90 days. Financial services companies need to break through the competition to gain customer trust and loyalty. Building a 360° view of the customer can help banks grow customer retention and loyalty, upsell high margin products and provide compelling interactions. However, this is no easy task as complexity increases when retail banks engage their customers across multiple channels and financial products. Gaining visibility into every customer interaction, across your business silos, and with every engagement channel is critical to making the right decisions to deliver amazing customer experiences. This white paper examines the challenges Financial Services Institutions (FSIs) face when building a 360° view of the customer to transform their customer experience and how to overcome them.